AECOM is an american worldwide provider of professional technical and management support services to a broad range of markets, including transportation, facilities, environmental, energy, water and government. 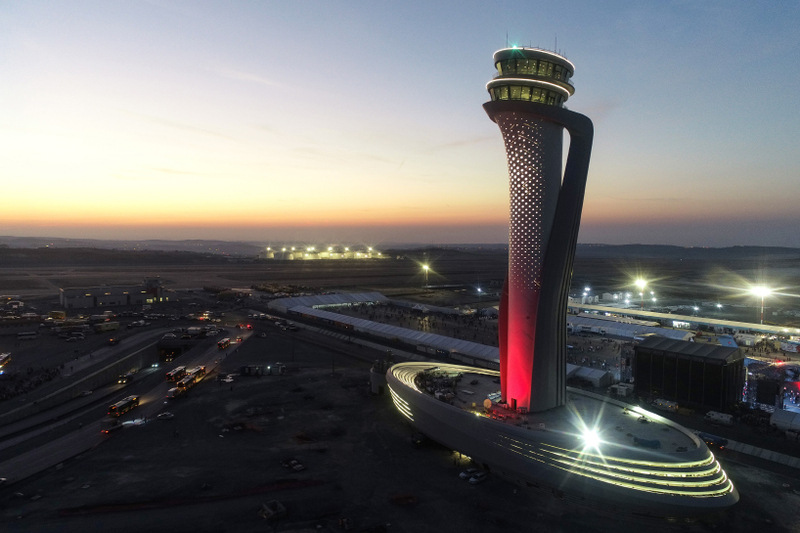 istanbul’s new airport, designed to become the world’s largest airport in terms of annual passenger capacity, has been officially inaugurated. 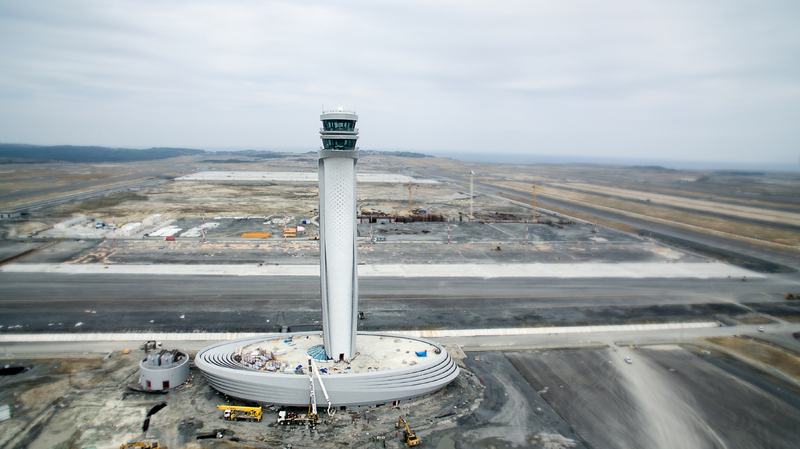 the airport, which is located 35 kilometers (22 miles) from the city center, will initially be able to accommodate up to 90 million passengers a year, with the final capacity set to reach 200 million. 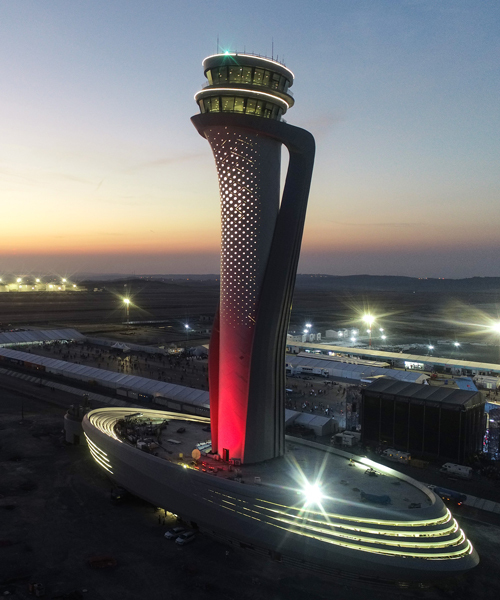 the site’s landmark air traffic control tower has been designed by pininfarina and AECOM, who won an international competition to complete the structure in 2016.
pininfarina and AECOM’s design for istanbul new airport’s air traffic control tower blends influences from the aerospace and automotive sectors with elements evocative of turkish culture. the scheme possesses two distinct control areas positioned at different altitudes. 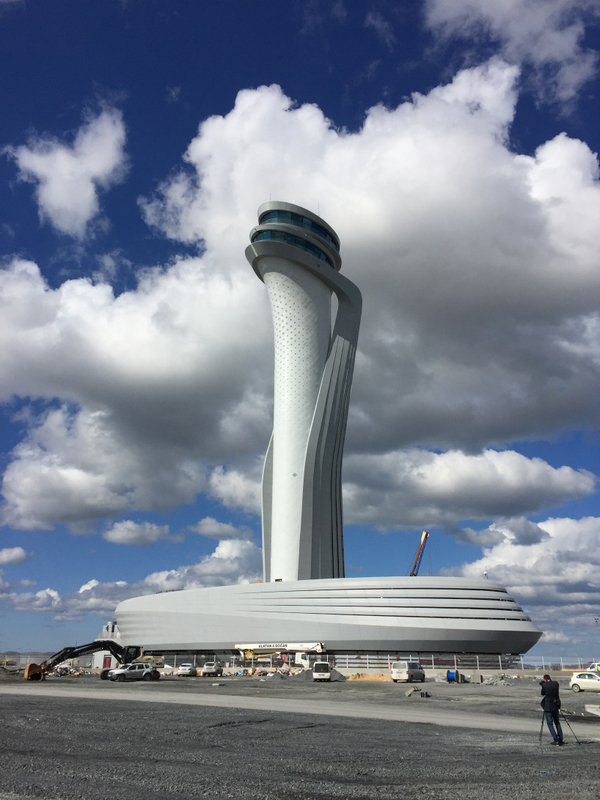 the 360 degree view of the air traffic controllers is guaranteed through glazing designed to optimize irradiation and acoustic comfort. 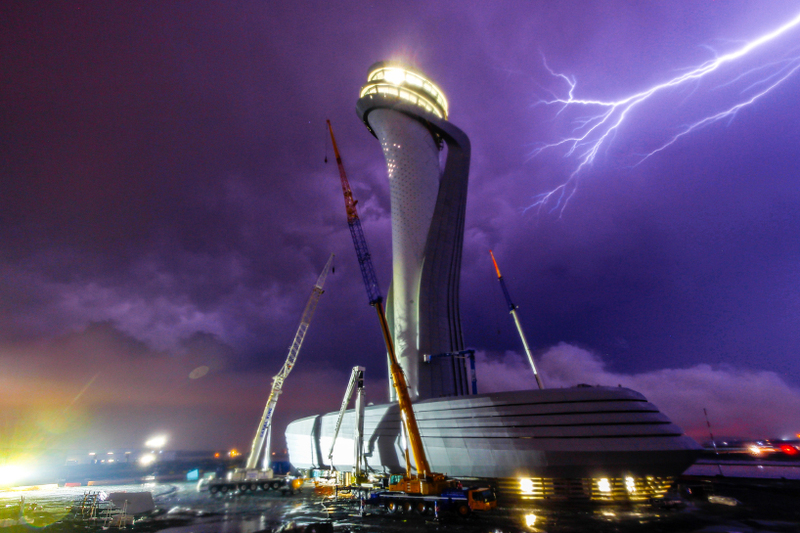 the tower serves as a proud new symbol of the city, visible to all passengers traveling between europe and asia. the tower itself is inspired by the tulip, for many centuries a symbol of istanbul and an important cultural reference in turkish history. 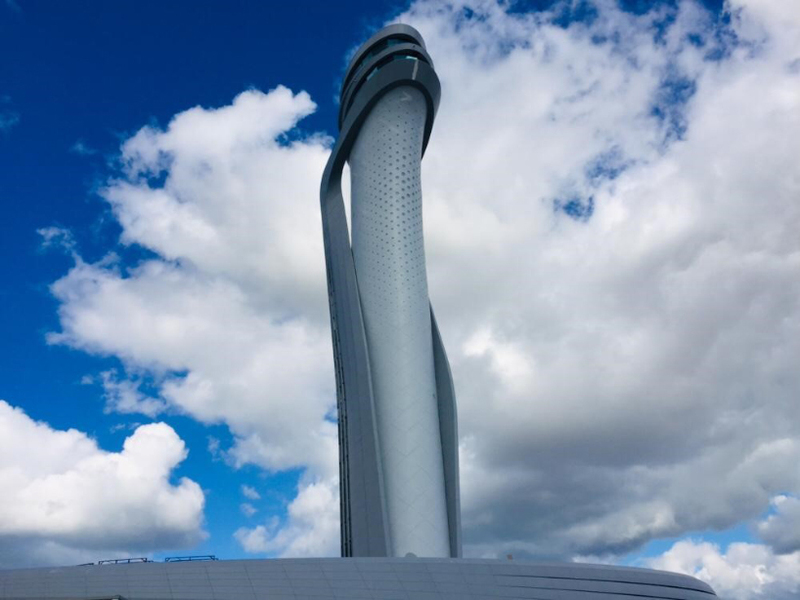 meanwhile, the elliptical shape of the tower appears to be sculpted by the wind and influences all aspects of the form and geometry of the technical building below. the central atrium has a bespoke skylight, typical of turkish historic buildings, realized to fill the spaces through a bright mosaic light. the interior configuration of the structure is based on the daily cycle of the staff that will sleep, eat, work, learn, play, and rest inside the building. sleeping zones benefit from the early morning sun and avoid exposure to bright sunlight, while each unit contains a raised bed, a small lounge area, and washing facilities. two lounge areas are located adjacent to the central atrium space on the first floor providing private dining rooms for staff. a more informal area dedicated to coffee breaks is located in the entrance hall on the ground floor. outdoor terraces with panoramic views provide places for staff to relax. the main work areas are connected to each other and enjoy maximum exposure to natural light. connected to the staff areas is the education center with classrooms, language and electronics laboratories, and a staircase theater dedicated to conferences. the structure is also equipped with a sports hall built as a recreational area for staff in order to encourage healthy lifestyles and social interaction. 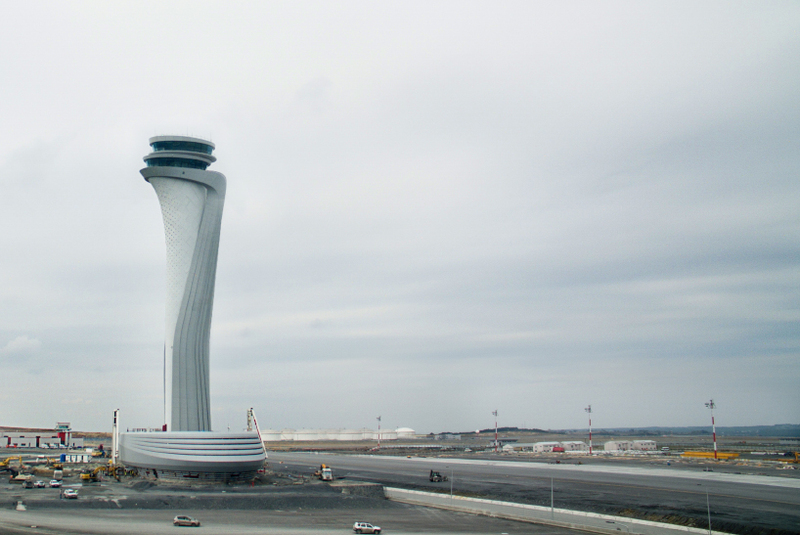 from an environmental standpoint, the design of the tower takes into account the strong climatic changes in istanbul. for this reason, an accurate solar analysis was carried out in order to reduce the structure’s energy consumption. the use of high-efficiency glass was also used to compensate for visual needs through the exploitation of natural light, while maintaining efficient insulation. 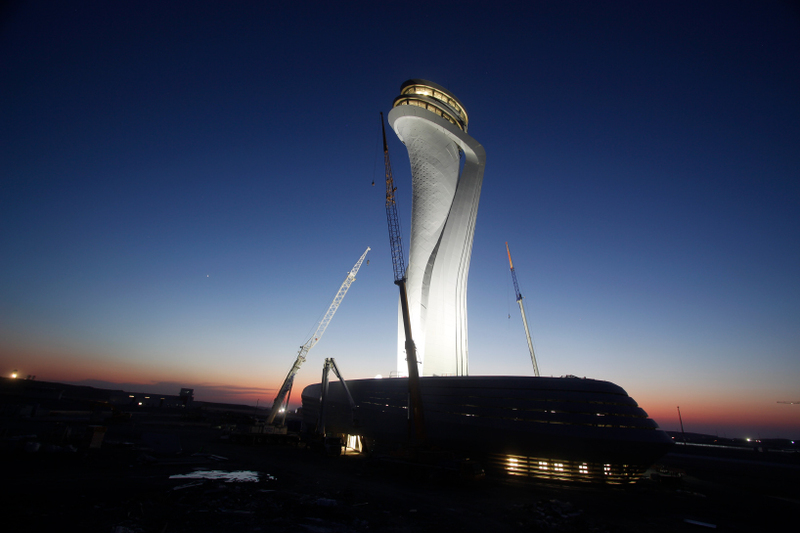 the tower will also be able to supply hot water through solar collectors and generate electricity on site through the use of photovoltaic panels. finally, a rainwater collection system has been developed to reduce the building’s water footprint.